In this two-part post, Stephen Basdeo analyses the evolving Romantic and Victorian legacy of the most famous heroic outlaw found in English folklore, Robin Hood. Fairholt, F. W. ‘Robin and Marian’ . In Gutch, J. M. A Lytell Geste of Robin Hode, Vol. 2 (London: Longman, Brown, and Green, 1847). [Scanned Image]. And their hours are old and gray. There is a definite sense of loss in those opening lines. In Keats’ poem, however, he is lamenting, not so much the fact that Robin Hood has died and has been long buried, but the medieval period itself. Keats was living during the industrial revolution, and the first half of the nineteenth century was a period in which there was a battle ‘between traditional values, rights and customs on the one hand, and capitalism, laissez-fair ideology and new middle-class values on the other’. [vi] Consequently, Keats looks back to the time when ‘men knew nor rent nor leases’. [vii] And what would be Robin Hood’s and Marian’s reaction if they were to be resurrected during the 1820s? Can’t be got without hard money! 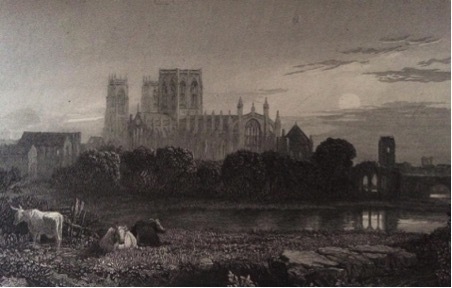 Stanfield, C. ‘York Minster’. In Scott, W. Ivanhoe: A Romance (Edinburgh: Adam and Charles Black, 1820:1871). [Scanned Image]. The medieval period was not described here as a ‘barbarous age’, as Ritson called it; [xii] rather, it was an idealised ‘merrie England’. One of the many characters in Ivanhoe is the ‘gallant’ outlaw leader, Robin of Locksley. He is a man who ‘does good, [despite] having unlimited power to do evil, [and] deserves praise not only for the good which he perfoms, but the evil which he forbears’. [xiii] The famous outlaw’s transition into a noble hero, begun by Ritson in 1795, has thus been completed by Scott in 1820. Far from being a localised figure who flourished in only in the forests South Yorkshire and Nottinghamshire, Locksley played a part in national history. He meets Richard I, he lays siege to the castle of Torquilstone and rescues Ivanhoe which simultaneously scuppers the machinations of “bad” Prince John to wrest the crown from Richard I. It is, furthermore, Locksley who urges Richard I to stop feasting in the forest and turn his attention to the condition of England. [xiv] The actions of one individual of fairly low-born status, in this case Locksley, resonate through time. Simeone explains that Scott, ‘intended to show that from the beginning of national history, ordinary men had an important part to play in the shaping of the nation […] his novel dramatizes the idea of history in which the lowest in the social order are as important as the highest’. [xv] Everyone in Scott’s idealised ‘merrie England’ had their part to play. 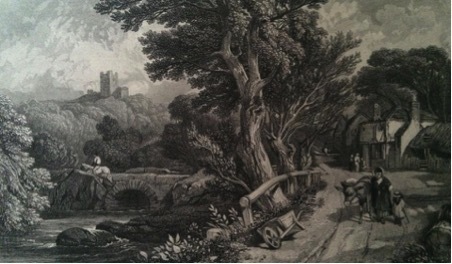 Stanfield, C. ‘Conisbrough Castle’. In Scott, W. Ivanhoe: A Romance (Edinburgh: Adam and Chaarles Black, 1820: 1871). [Scanned Image]. Scott was not critical of the social makeup of medieval England. In the novel Scott illustrates that medieval England had its problems, but those problems only occurred when there was a breakdown of feudal relationships, when people reneged on their oaths to their superiors. Locksley in Ivanhoe is far more of a freedom fighter than he is an outlaw. He champions the rights of the oppressed Saxon barons against their oppressive Norman overlords. It is for this reason that Scott did not portray Locksley as entirely un-menacing; there is always the threat that Locksley could have resorted to violence, even if he never actually does in the novel. Scott was a Tory, and his social conservatism in Ivanhoe represents ‘a fear towards the common man’ as well as ‘an active concern for the popular welfare’. [xvi] Scott, of course, had lived through the period of the French Revolution and the Napoleonic Wars (1789-1815), an example of what could occur when established social relationships broke down. More recently for Scott, in the year 1819 when he was completing Ivanhoe, there was the tragic Peterloo Massacre, when around 60,000 people gathered in St. Peter’s Fields in Manchester to effect parliamentary change, and troops were sent in to suppress the meeting, resulting in 15 deaths. [xvii] Despite Scott’s conservatism however, it is clear that the low-born Franklin Robin of Locksley is as important in national history as the kings, queens, lords and barons, who were the subject of established historiography. Scott’s solution to the disturbances of social order in the nineteenth century are found in the medieval period of Ivanhoe: ‘the serf should be willing to die for his master, the master willing to die for the man he considered his sovereign’. [xviii] By maintaining the loyalty of one class towards the other, there would, by Scott’s reasoning, be social harmony. In conclusion, during the Romantic period the popular outlaw Robin Hood had been transformed from a common criminal into a Romanticised hero. It was a process which was begun by an obscure antiquary, Joseph Ritson, in 1795, who transformed Robin Hood into a bold man of fighting spirit. This vision of a ‘gallant’ outlaw was then taken up by John Keats and Walter Scott. For Keats, Robin Hood and the medieval period was the locus for nostalgia. The days of Robin Hood were over, replaced by erosion of the outlaw’s favourite haunts and the supplanting of customary human relationships with capitalism, the ‘callous cash payment’. For Scott, the medieval days of the greenwood may indeed have passed, but there were lessons to be learnt from the actions of men in the medieval period; all men were important and had a part to play in history; yet for there to be social harmony, each class must maintain its loyalty towards the other. The medieval period thus provided Romantic-era writers with a model of an idealised society, but when those ideal social relationships broke down, there was Robin Hood to stand up and right the wrongs in society. [i] Ritson, J. ‘Life of Robin Hood’. In Ritson, J. ed. Robin Hood: A Collection of all the Ancient Poems, Songs, and Ballads, Now Extant, Relative to that Celebrated English Outlaw (London: C. Stocking, 1795: 1823), p.VI. [ii] Harris, N. ‘The Life of Joseph Ritson’. In Harris, N. ed. The Letters of Joseph Ritson, Esq. Vol. 2 (London: William Pickering, 1833), p.LIX. 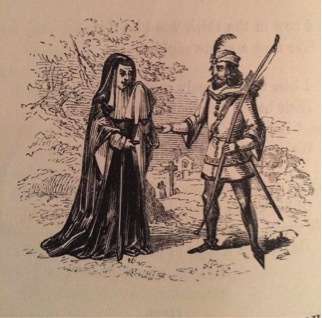 [iii] Spraggs, G. Outlaws and Highwaymen: The Cult of the Robber in England from the Middle Ages to the Nineteenth Century (London: Pimlico, 2001), p.245. [iv] Keats, J. ‘Robin Hood: To a Friend’ . In Wright, P. ed. The Complete Poems of John Keats (London: Wordsworth, 1987), p.231. [v] Keats, ‘Robin Hood’, p.230. [vi] Crone, R. Violent Victorians: Popular Entertainment in Nineteenth-Century London (Manchester: Manchester University Press, 2012), p.17. [vii] Keats, ‘Robin Hood’, p.230. [viii] Mosley, S. The Environment in World History (London: Routledge, 2010), p.33. [x] Marx, K. & Engels, F. ‘The Communist Manifesto’ . In McLellan, D. ed. The Communist Manifesto (Oxford: Oxford University Press, 1992), p.5. [xi] Scott, W. Ivanhoe: A Romance (Edinburgh: Adam & Charles Black, 1820: 1871), p.21. [xii] Ritson, ‘Life of Robin Hood’, p.XII. [xv] Simeone, W. E. ‘The Robin Hood of Ivanhoe’. The Journal of American Folklore 74: 293 (1961), p.231. [xvi] Chandler, A. ‘Sir Walter Scott and the Medieval Revival’. Nineteenth-Century Fiction 19: 4 (1965), p.324. [xvii] Marlow, J. The Peterloo Massacre (London: Rapp & Whiting, 1969), p.125. [xviii] Chandler, ‘Sir Walter Scott and the Medieval Revival’, p.332.